An RC-135 Rivet Joint reconnaissance aircraft moves into position behind a KC-135T/R Stratotanker for an aerial refueling. The RC-135 is a United States Air Force reconnaissance aircraft used to support theater and national level consumers with near real-time on-scene intelligence collection, analysis and dissemination capabilities. The aircraft is an extensively modified C-135 in which the modifications are primarily related to its on-board sensor suite, which allows the mission crew to detect, identify and geolocate signals throughout the electromagnetic spectrum. The mission crew can then forward gathered information in a variety of formats to a wide range of consumers via Rivet Joint's extensive communications suite. The RC-135 fleet is currently undergoing significant airframe, navigational and powerplant upgrades which include re-engining from the TF-33 to the CFM-56 engines used on the KC-135 Stratotanker and upgrade of the flight deck instrumentation and navigational systems to the AMP standard, including PacerCRAG. The AMP standard includes conversion from analog readouts to a digital "glass cockpit" configuration. The current RC-135 fleet is the latest iteration of modifications to this pool of aircraft going back to 1964. Initially employed by Strategic Air Command to satisfy nationally tasked intelligence collection requirements, the RC-135 fleet has also participated in every sizable armed conflict involving U.S. assets during its tenure. RC-135s were present supporting operations in Vietnam, the Mediterranean for Operation El Dorado Canyon, Grenada for Operation Urgent Fury, Panama for Operation Just Cause, the Balkans for Operations Deliberate Force and Allied Force, and Southwest Asia for Operations Desert Shield, Desert Storm, Enduring Freedom and Iraqi Freedom. RC-135s have maintained a constant presence in Southwest Asia since the early 1990s. All RC-135s are assigned to Air Combat Command. The RC-135 is permanently based at Offutt Air Force Base, Nebraska and operated by the 55th Wing, using various forward deployment locations worldwide. The standard as-delivered version of the RC-135. 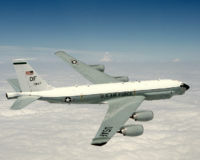 Modified RC-135B aircraft used for strategic reconnaissance duties, and equipped with the AN/ASD-1 reconnaissance system. Due to the protuding fuselage sides, these aircraft were nicknamed the "Chipmunk". Three D model aircraft were produced for the Rivet Brass program, 60-0356, 60-0357 and 60-0362. These three aircraft were originally produced as KC-135As, but delivered without refueling booms, known as "falsie C-135As" pending the delivery of the first actual cargo aircraft in 1961. Rivet Brass flew along the northern border of the Soviet Union. At the completion of the program, the aircraft were reconverted into tankers, and are currently in the fleet as KC-135Rs. Rivet Amber was a one-of-a-kind aircraft equipped with a large Hughes phased-array radar system. It was deployed from Shemya, Alaska, and operated together with the Rivet Ball aircraft (see below). The radar system alone weighed over 35,000 pounds and cost over USD$35 million (1960 dollars), making Rivet Amber both the heaviest C-135-derivative aircraft flying and the most expensive Air Force aircraft for its time. The system could track an object the size of a soccer ball from a distance of 300 miles, and its mission was to monitor Soviet ballistic missile launches. On June 5, 1969, Rivet Amber was lost in flight, and no trace of the aircraft or its crew was ever found (see Rivet Amber crash for details). Click on the following URL (http://www.rc135.com) for a story about Rivet Ball, Rivet Amber and Shemya, "A Tale of Two Airplanes", by Lt. Col. Kingdon R. "King" Hawes, USAF (Ret.). This aircraft was operated by the 82nd Reconnaissance Squadron during the Vietnam War from Kadena AB, gathering ELINT as a part of operation Combat Apple. 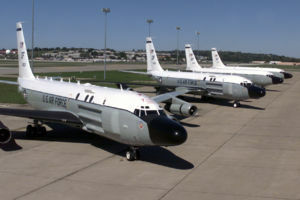 There were six RC-135M aircraft, 62-4131, 62-4132, 62-4134, 62-4135, 62-4138 and 62-4139, all of which were later modified to RC-135V/W configuration. Rivet Ball was the predecessor program to Cobra Ball, and was initiated with a single RC-135S (serial 59-1491, formerly a JKC-135A) on December 31, 1961, although the "Rivet Ball" name was not assigned until 1967. The aircraft was deployed from Shemya, Alaska. During its conversion, a large radome was installed to house the aircraft's mission-specific S band radar. Besides the over-sized radome, the aircraft was characterized by ten large portholes on the right side of the fuselage, forward of the wing, used for tracking cameras. Rivet Ball holds the distinction of obtaining the first documentation of Soviet MIRV testing in 1968. The aircraft was destroyed in a landing accident on January 13, 1969, although the entire crew was unhurt. Two Cobra Ball aircraft on the flightline at Offutt Air Force Base, Nebraska. The RC-135S Cobra Ball is equipped with special optical instruments designed to observe ballistic missile flights at long range. The aircraft is an extensively modified C-135. There are two aircraft in service and they are part of the 55th Wing, 45th Reconnaissance Squadron based at Offutt Air Force Base, Nebraska. Cobra Ball aircraft were originally assigned to Shemya and used to observe ballistic missile tests on the Kamchatka peninsula in conjunction with Cobra Dane and Cobra Judy. Click on the following URL (http://www.rc135.com) for the history of Cobra Ball by Lt. Col. Kingdon R. "King" Hawes, USAF (Ret.). Combat Sent aircraft in flight. Notice the unique nose cone, wingtips, tail, etc. The RC-135U, or Combat Sent, is a reconnaissance aircraft in use by the United States Air Force. The aircraft is designed to locate and identify foreign land, naval, and aerial radar signals, and relay this information to intelligence communities. Distinctly identified by the antennae arrays on the nose and wing tips of the airframe, along with extended tail, there are currently only 2 Combat Sents in the USAF, both based at Offut AFB, Nebraska, under the 55th Wing. Minimum crew requirements are 2 pilots, 2 navigators, 3 systems engineers, 10 electronic warfare officers, and 6 area specialists. The RC-135V/W sensor suite allows the mission crew to detect, identify and geolocate signals throughout the electromagnetic spectrum. The mission crew can then forward gathered information in a variety of formats to a wide range of consumers via Rivet Joint's extensive communications suite. The interior seats 34 people, including the cockpit crew, electronic warfare officers, intelligence operators and airborne systems engineers. All Rivet Joint airframe and mission systems modifications are performed by L-3 Communications in Greenville, Texas, under the oversight of the Air Force Materiel Command. Under the "BIG SAFARI" program name, RC-135Vs were upgraded from the RC-135C "Big Team" configuration, itself a mission modified RC-135B (the first version delivered). The difference between the original and upgraded RC-135Vs and Ws is the different engines used. Another variation is the RC-135X, only one of which was created (from an C-135B Telemetry/Range Instrumented Aircraft) in the mid-1980s and used until 1993 when it was converted into an additional RC-135S/W. Mission flight crew: 21-27, depending on mission requirements, minimum consisting of 3 Electronic Warfare Officers (Ravens), 14 Intelligence Operators and 4 Airborne Systems Engineers. Air Force Link, (2005). RC-135V/W RIVET JOINT. Retrieved December 7, 2006. This page was last edited on 16 July 2009, at 11:31.